This reportedly 2000 pound, nearly 20 foot Great White shark was unexpectedly caught by two Mexican commercial fishermen in the Sea of Cortez last Sunday. The two fishermen known only as Guadalupe and Balthazar were pulling up their commercial fishing lines when they made the shocking discovery. They were not used to having a massive beast tangled in their lines and thought they had just caught a mother load of fish. 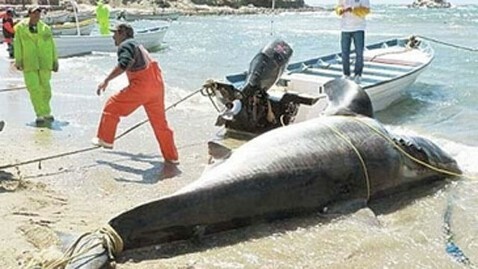 Unfortunately the shark was dead by the time they found him and they had to very carefully and slowly tow it back to shore due to the added weight. On shore it took over 50 people to drag the giant fish onto the beach. 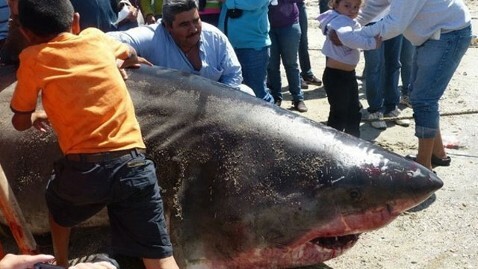 If the shark is confirmed to be 20 feet long it will be the largest Great White ever caught.